Sun dried tomatoes have the same nutritional value as the fresh tomatoes they are made from: they are high in Lycopene, antioxidants, vitamin C and low in sodium, fat, and calories. A relatively small amount of sun-dried tomatoes gives a gourmet touch and a burst of flavor to a variety of recipes. 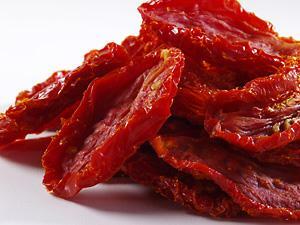 Our organic sun dried tomatoes are free of any kind of preservatives and sulphur dioxide. Harvest is done when the warm Mediterranean sun brings out the full flavor and color of the crop. After that, the tomatoes are halved and salted in salty water mixture and laid under the warm sun. The final product is packed and shipped only after the dried-halves are re-washed and controlled one by one. We can provide our customers the best organic sun dried tomatoes in different cuts, different sizes, and in a variety of packaging styles.